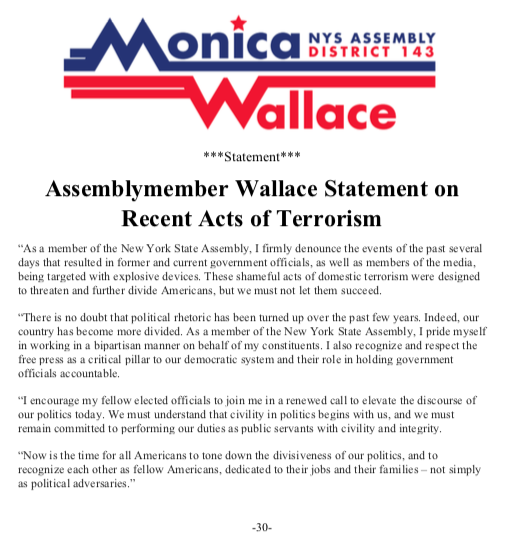 “As a member of the New York State Assembly, I firmly denounce the events of the past several days that resulted in former and current government officials, as well as members of the media, being targeted with explosive devices. These shameful acts of domestic terrorism were designed to threaten and further divide Americans, but we must not let them succeed. “There is no doubt that political rhetoric has been turned up over the past few years. Indeed, our country has become more divided. As a member of the New York State Assembly, I pride myself in working in a bipartisan manner on behalf of my constituents. I also recognize and respect the free press as a critical pillar to our democratic system and their role in holding government officials accountable. “I encourage my fellow elected officials to join me in a renewed call to elevate the discourse of our politics today. We must understand that civility in politics begins with us, and we must remain committed to performing our duties as public servants with civility and integrity.